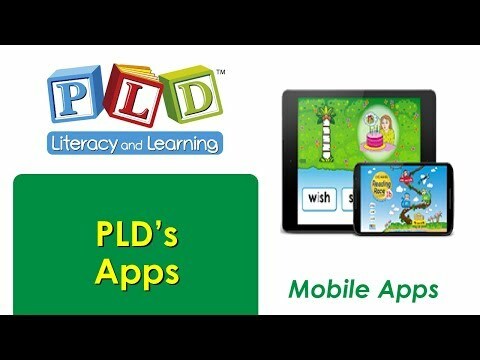 PLD’s Apps have a strong emphasis on alphabet and phonic sounds and phonemic awareness. (i.e. synthetic phonics) and develop reading skills across a range of words which gradually increase in complexity. They are designed to captivate children’s attention whilst they engage in quality learning and facilitate learning in entirely new ways. They can be used in conjunction with specific PLD programs or as stand-alone programs. Our suite of apps are available on the Apple App Store (included in the VPP) and include a selection of app bundles, as well as being available on the Google Play Store and Chrome Web Store. Click on the titles below to view on the App Store. Reading Race 1a: CVC words is the first in the four-game ‘Reading Race’ series of reading apps from PLD Literacy & Learning. This fun educational game app was designed for children between the ages of 4 and 6. CVC words or consonant-vowel-consonant words are simple three-letter words such as mat, dog and sit. Reading Race 1b: sh, ch, th, oo, ee and ck words is the second in the four-game ‘Reading Race’ series of reading apps from PLD Literacy & Learning. Designed for children between the ages of 4 and 6, this fun and engaging educational game is designed to teach a range of different phonic concepts including sh, ch, th, oo, ee and ck. Reading Race 1c: CCVC and CVCC words is the third in the four-game ‘Reading Race’ series of reading apps from PLD Literacy & Learning. Designed for children between the ages of 4 and 7 by Australian speech pathologist, Diana Rigg, this dynamic and engaging game teaches children about CCVC (consonant-consonant-vowel-consonant) words such as such as spot, frog and club along with CVCC (consonant-vowel-consonant-consonant) words such as lift, tent and lamp. This app was specially designed for use at home or in a school setting. It provides practice sounding out words and blending sounds, which is especially important for progressing in literacy. While playing Reading Race, children will gain experience with sounding out words of increasing complexity and length. Reading Race 1d: ar, or, ai, ay and oi words is the fourth in the four-game ‘Reading Race’ series of reading apps from PLD Literacy & Learning and Australian speech pathologist, Diana Rigg. Created for children between the ages of 4 and 7, Reading Race 1d teaches children about simple phonics concepts such as ar, or, ai, ay and oi. Children will learn how to sound out and recognize words such as start, north, paint, stay and coin. This app is perfect for use at home or at school. Children will get a great start on their reading skills while having fun and playing! PLD 2P Read 1a is an innovative two player early literacy game designed by Diana Rigg a renowned Australian Speech Pathologist and Educator. One of the few genuine phonics based activities perfect for early childhood classrooms. • Rehearse their decoding and single word word reading skills. • Extend their decoding and single word reading skills by gradually increasing the complexity of the words presented. • Alphabet and phonic sounds (rather than letter names). • The combining or blending of sounds (i.e. phonemic awareness) which is an essential foundation skills when extending reading ability. • An ordered sequence of reading concepts. PLD 2P Read 1b is an innovative two player early literacy game designed by Diana Rigg a renowned Australian Speech Pathologist and Educator. One of the few genuine phonics based activities perfect for Year 1 and early childhood classrooms. • An ordered sequence of phonic concepts. To rehearse their decoding and single word reading skills. To extend decoding and reading skills by introducing four sound words that contain double constants, initially at the start of words(i.e. CCVC words) and then at the end of words (i.e. CVCC words). Alphabet and phonic sounds rather than letter naming. To extend their decoding and reading skills by introducing early phonics concepts (ar, or, ai, ay, oi) in a gradual manner. 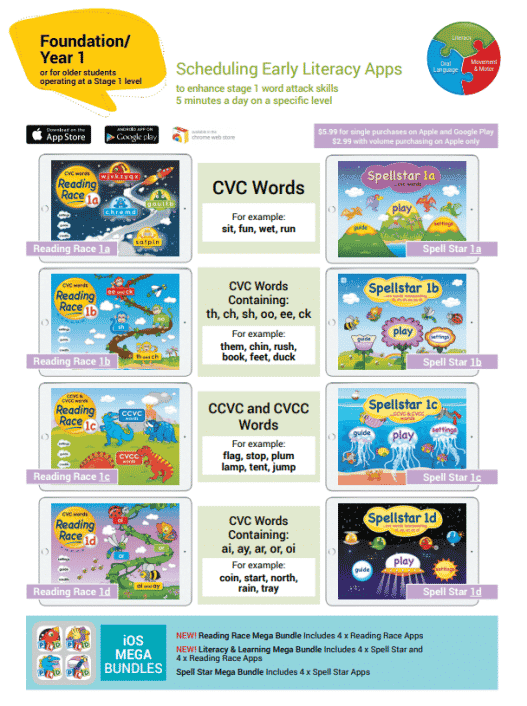 PLD’s Literacy app Spell Star 1A: CVC Words is the first in the four-game series from PLD Literacy & Learning. Developed for 5-6 year olds by Australian speech pathologist Diana Rigg, this fun game teaches the spelling of CVC (consonant-vowel-consonant) words like mat, dog and sit. This game gives young spellers a chance to rehearse their single word spelling skills. Your child (or student) will also gain familiarity with phonic sounds (instead of letter names) and as their confidence grows, they’ll progress through the app’s game interface, learning slightly more challenging words! While playing Spell Star, children will also get practice with sounding out words, which is a key foundation skill for strong reading and spelling skills later on. PLD Spell Star 1B: ch, ch, th, oo, ee, ck words is the second app in the four-game ‘Spell Star’ series from PLD Literacy & Learning. Created by Australia-based speech pathologist Diana Rigg, this dynamic and engaging game was designed for children from 5-6 years old. It’s designed to teach children about words with sh, ch, th, oo, ee and ck, such as luck, ship, chat, them, teeth and look. Children will get lots of practice spelling and sounding out these simple words, which gradually increase in complexity as children progress through the game. What’s more, this unique app series teaches children to “sound out” spelling words using the alphabet and phonic sounds. PLD Spell Star 1C: CCVC and CVCC Words is the third app in the four-game ‘Spell Star’ series from PLD Literacy & Learning. Created by prominent Australian speech pathologist Diana Rigg, this dynamic single player game was designed for 5-6 year-old children. This app teaches children about CCVC (consonant-consonant-vowel-consonant) words such as spot, frog and club along with CVCC (consonant-vowel-consonant-consonant) words such as lift, tent and lamp..
Children gain experience and confidence as they sound out and spell new words, which increase in complexity as they progress through the app. PLD Spell Star 1D: ar, or, ai, ay and oi words is the fourth app in the four-game ‘Spell Star’ series from PLD Literacy & Learning. Designed for young first year students, this app was developed by Australian speech pathologist, Diana Rigg. This app teaches children about words that include ar, or, ai, ay and oi, such as start, north, paint, stay and coin. This simple but engaging single player game is perfect for use in the classroom or at home. Children will gain valuable experience sounding out words and spelling words. This results in a huge boost in confidence and improved vocabulary. The difficulty level gradually increases as children progress and learn.